Like many other bloggers, not a day goes by when I do not get an email of some kind from a PR company or marketing agency trying their luck in getting me to promote their product/endorse their campaign/sample their goodies. Typically I ignore them. Too busy with work and other matters, quite frankly. The one exception was last year when I replied with a preposterous counter-offer, and was taken at my word. The rest, as they say, is history. Or a very silly video, at least. So, a couple of weeks ago I receive this email. I am reproducing in full the exchange (only blanking out the obvious) if for no other reason to see how many future PR or marketing pitches take notice. I stumbled across your blog and immediately thought it would make the perfect place for me to write a guest post. I work closely with rate comparison site (name of company) and, with their help, I know of numerous ways to save money on broadband, phone deals, credit cards and mortgages. I have guest posted for a variety of bloggers and the feedback has always been positive. I'm confident the content will be useful for your readership. The piece would not be biased or blatantly advertorial (rather, it would offer useful tips for saving money). But, because I'd be keen to link to the (company) website, I'm happy to compensate you with £50. Would you like me to push ahead and write an article for you? Typically I do not respond to such solicitations, but I am making an exception here, if only to annotate a few points and flag them to you. Firstly, your comment about how you "stumbled across" my blog, and yet are addressing me by my first name. Either you are lying about the stumbling bit - because my name does not appear anywhere, nor do I publicise it - or you are incredibly perceptive and have struck lucky with your first guess. I believe the former is more applicable. Secondly, and once more to the 'stumbling' anecdote, if you were indeed as smart as you pertain to be - by stating that my blog would be "the perfect place" for you to contribute your positively received writings (I paraphrase) - you would quickly realise that a) I do not 'do' guest posts, and b) I have only ever done a couple of sponsored posts and that was some two years ago. Thirdly, and I hate to press the point, but the clue is in the name: London City Mum. The specifics are under my profile, ie I work full time. Much as I am flattered by the offer to compensate me with £50 for your efforts, I will have to turn you (and your sponsors) down. I did indeed notice that your name is not on the website. And I don't appreciate being accused of lying. I have installed (application name) - a startup that works as a (name of provider) add on to display social media information about contacts as their address in typed in. So, somewhere in the past you have put your name to that email address and the clever and social programme has scraped that information and delivered it back to me. It's not underhand. And it's certainly not lying. It's simply a useful programme that many people who work in social media utilise. I don't pertain to be smart - nowhere in my communication with you have I pertained to be smart, certainly. I simply offered you a deal. Many bloggers are interested in this deal and I have provided quality content for them. As for your third point, I don't really see how it means anything. I'm not suggesting you need my money - I am simply offering it as a transaction. As I say, many bloggers accept and are happy with the outcomes. Now I have no intentions of creating bad blood but I find the tone of your email patronising and accusatory. If you are not interested in my proposed deal, then that is all you need to say. I think the truth is that you were taken aback that I knew your name when you had obviously taken measures to hide it from your blog readership. I'm sorry we got off on the wrong foot and I wish you well. So I replied. Again. (I must have been having a boring evening). No hard feelings and certainly was not my intention to be accusatory. My sarcasm - inherent in my blog - is obviously something that has not translated to the printed word in this exchange. The bottom line is that I will not be taking you up on your proposal, but thanks for offering. And the final answer back. Thanks for your reply - I understand. And the moral of the story? I think my lovely friend Potty Mummy put it perfectly in the ensuing tweets. PR firms, please take note. Although I'm not holding my breath. 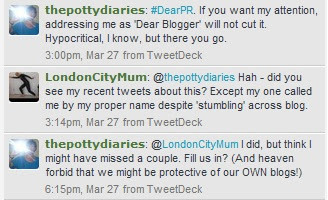 NOT a 'mummy blogger'. Working, cycling, living life. If you locate the laundry fairy, please direct her my way. Still debating with Other Half (OH) about the validity of Twitter. Despite the notion that imitation is the most sincerest form of flattery, and I would love to think that someone would deem my writing/rambling/verbal diarrhoea worthy of plagiarism, all text and images in this blog are copyrighted to me, unless otherwise acknowledged. Brits To Trump: Bugger Off! How important is social status at a certain age? For the Good of Virginia, and America, Ralph Northam Must Stay. But He Won’t. Freedom of speech is the freedom to speak without censorship and\or limitation. The synonymous term freedom of expression is sometimes used to indicate not only freedom of verbal speech but any act of seeking, receiving and imparting information or ideas, regardless of the medium used. The right to freedom of speech is recognized as a human right under Article 19 of the Universal Declaration of Human Rights and recognized in international human rights law in the International Covenant on Civil and Political Rights (ICCPR). The ICCPR recognizes the right to freedom of speech as "the right to hold opinions without interference. Everyone shall have the right to freedom of expression". Furthermore freedom of speech is recognized in European, inter-American and African regional human rights law. So there. Stick that in your pipe and smoke it.